General Hospital (GH) spoilers tease that Nelle (Chloe Lanier) could be getting in over her head. Her plot to “haunt” Carly (Laura Wright) is definitely revving up. In exchange for cases of vodka, Nelle got some hobo named Cal to sell Carly a bogus story. Jason (Steve Burton) and Dante (Dominc Zamprogna) were also around to get this phony scoop. Cal claimed that he saw a well-dressed man repeatedly dialing that payphone. He suggested the guy was probably a drug addict. 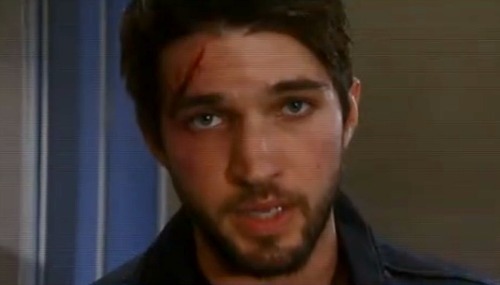 This is likely the next step toward making Carly believe Morgan’s (Bryan Craig) alive. There are a few ways GH could take this story from here and each one would be quite exciting. How can they really make this work without some Morgan sightings? Perhaps Morgan’s comeback is already in the works. General Hospital showed us someone creeping in the bushes and we were meant to believe it was Cal. However, there could easily have been someone else spying as well. It’s possible Morgan’s back from the dead and watching. Even if he isn’t, he may show up in some form down the road. Nelle might truly drive Carly over the edge and trigger some Morgan hallucinations. Since Nelle clearly has some mental issues, she could even face hallucinations of her own. Nelle’s plan could backfire and spark a return trip to the psychiatric hospital. Then again, Craig could return to play his own doppelganger. What if Nelle tracks down someone who looks exactly like Morgan for her evil scheme? In the soap world, that’s perfectly reasonable. Someone’s doppelganger can be lurking around any corner. The description Cal offered could be a big hint. After all, Nelle will probably need someone to haunt Carly in the flesh at some point. Phone calls and messages can only do so much, especially since Carly intends to block the number from that location. The fact that it’s near the site of Morgan’s death is the main draw. Nelle will need a way to take things up a notch, so throwing in fake Morgan would be great. General Hospital spoilers say Nelle’s plot will bring major bombshells, so don’t be surprised if Morgan pops up for some of the craziness. We’ll give you updates as other GH news comes in. Stick with the ABC soap and don’t forget to check CDL often for the latest General Hospital spoilers, updates and news.